I’m all for STEAM…an adaptation of the STEM movement that involves incorporating the arts into STEM. STEAM is more than art-for-art’s sake (though, as an M.A. in Humanities, I firmly believe it has its place!). STEAM is about engaging the other half our brain…the creative, feeling, right-hemisphere while learning about the sciences. STEAM utilizes our creative right brain while teaching about the left-side logical stuff. PHOTO COURTESY JOSE ALHAMBRA. PUBLIC DOMAIN.NET. The STEAM approach is particularly useful for the early grades because it is SO engaging. Expecting young learners to synthesize a list of STEM facts in useful ways is unrealistic. However, allowing learners to explore STEM concepts integrated with visual arts, literature, music and dance provides a tangible experience for students to apply their learning and draw on in the future. A first-grade class is learning about sound. Their teacher decides to extend the theme into an art unit. Students make a set of wind chimes, using a rainbow of colors. The wind chimes are of varying lengths so they make a range of pitches. Another first-grade unit involves observing the classical Chladni plate experiment–which demonstrates that sound will move sand on a metallic surface into geometric patterns. Students each select a geometric pattern to replicate in art. Their medium is glue and glitter! They write about their art and its connection to the Chladni experiment, displaying their work beneath their artwork. 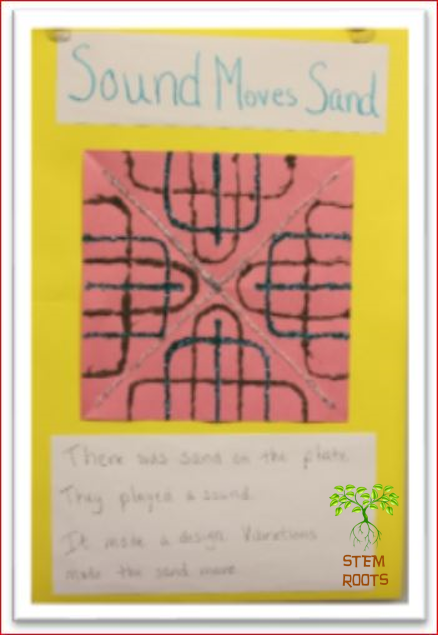 Working with glitter, sand and glue, students depict geometric patterns observed during Chladni plate sound experiments and write about their art in my STEM Roots Sound Wave Cove Lesson Plans. Of course, the better answer is Case 2. It connects the art project directly with the STEM learning! In this case, you can still discuss art principles like abstraction and symmetry (a math principle as well!). But, in this case, they are using their art to depict something they have observed from science. Writing about the art is a critical element of this assignment. Writing provides an opportunity to synthesize, first, while writing and, again, each time the student’s work is reviewed with them by a teacher or parent. The more times the principles are reviewed, the stronger those neuro-pathways become, increasing the likelihood that the principles stick! Now back to Case 1, the wind chimes… don’t throw them out just yet! Though art-for-art’s sake at the moment, this idea lends itself to a STEAM project with a little tweaking. How about a discussion with the class about why the wind chimes make sound? (So it’s aligned with the NGSS standard about sound and vibrations: 1-PS.) Then, add a clever write-up to help your students get it down on paper (think Common Core 1.2.10). Evaluate STEM content for arts opportunities. Evaluate art projects to connect them to STEM studies. Incorporate writing with art-science projects to solidify learning. 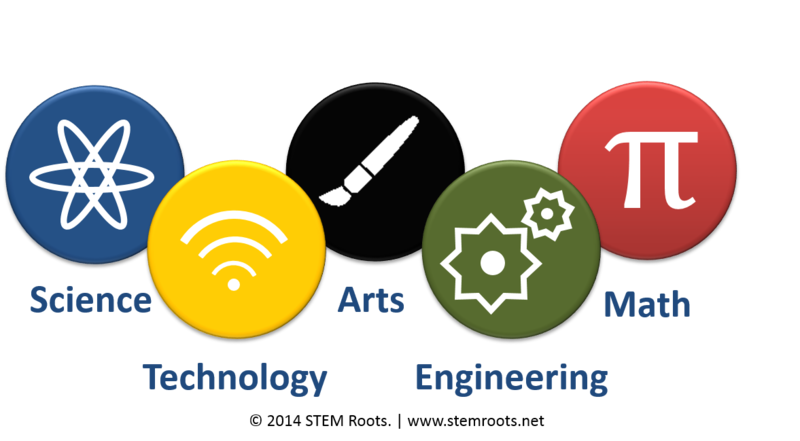 There may be resources in your area available to assist with STEAM! Here in the Great Pacific Northwest, we have the Right-Brain Initiative. This organization funded by our Regional Arts Council, works with local STEAM schools on arts-science integration. And our local STEAM school brought in another local non-profit, MyVoiceMusic to teach music and sound topics to students. Chances are, either intentionally, inadvertently, or both–you already are teaching STEAM in your classroom. What STEAM projects have you taught that are most memorable? Do you actively seek out arts-science activities? Do you think it enhances or takes away from STEM teaching?